DreamHost today announced the launch of Remixer, its new website click-to-edit website builder for users who simply want an easy-to-maintain website without having to touch any code. The new platform is included with any DreamHost hosting plan. If you’ve used similar platforms in the past, Remixer will likely feel familiar. 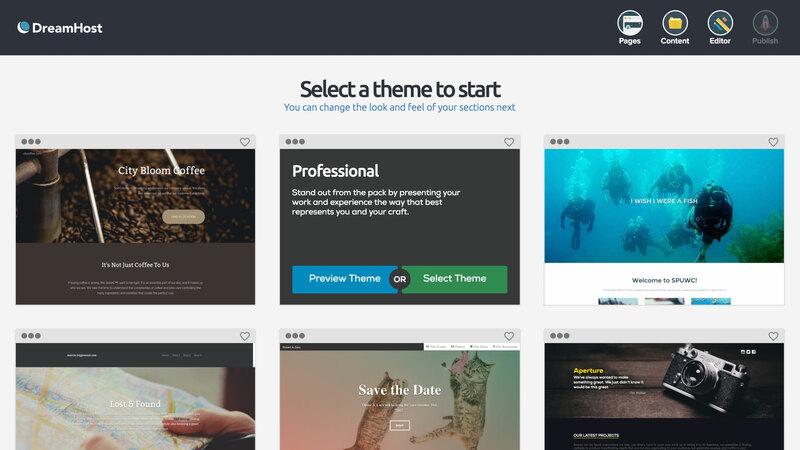 You start with a pre-made theme (there are currently 13 themes available, with more on their way), and then you can upload images or import them from Instagram, Facebook and other services. You can also import audio and video from SoundCloud, YouTube and Vimeo. Like similar services, Remixer also allows you to add maps, comment sections and forms with just a few clicks. In total, the service features over 70 content sections. DreamHost also included access to a library of about 600,000 royalty-free images and graphics. While you probably know DreamHost for its hosting services, the company has also long played a major role in the OpenStack ecosystem. OpenStack is an open-source project that essentially allows large businesses, telecom firms and hosting companies to run an AWS-like cloud-computing service in their data centers. DreamHost built Remixer on top of OpenStack and the Kubernetes container management service. Indeed, the application runs as a set of microservices on top of a Kubernetes cluster that run on the OpenStack-powered DreamCompute platform.